Franciscan Father Michael Duffy (left), one of the founders of the Franciscan Volunteer Ministry, stands with some of the program's volunteers March 2 at the motherhouse of the sisters of the Blessed Sacrament. 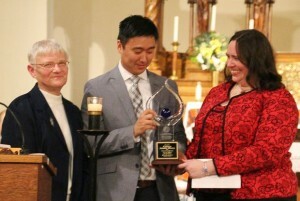 At left, Sister Patricia Suchalski, president of the Sisters of the Blessed Sacrament, presents the order’s National Justice Award to Matthew Johnson and Katie Sullivan representing the Franciscan Volunteer Ministry, at the Bensalem motherhouse March 2. It is the tradition of the Sisters of the Blessed Sacrament to present their annual National Justice Award to a person or persons as part of the celebration of the Feast Day of their foundress, St. Katharine Drexel. This year, after the Mass in celebration of her feast day at their motherhouse in Bensalem, the sisters varied the tradition by presenting the award to a lay organization – the New York-based Franciscan Volunteer Ministry, sponsored by the Holy Name Providence, Order of Friars Minor. Locally four young volunteers who will serve one or two years live and work at St. Francis Inn, a popular soup kitchen in the Kensington section of Philadelphia. That description could aptly describe the sisters themselves, except in their case it is a life-long commitment rather than a temporary mission. This difference was noted by Father Michael Duffy, O.F.M., who was the homilist in the Jubilee Mass celebrated by Father Fidelis Weber, T.O.R. In an era when neither seminaries nor convents have their former numbers but do have emerging lay ministries, “The Holy Spirit is working, maybe not in the way we are used to, but the Holy Spirit is alive and well,” he said. He compared this service to the efforts of athletes or actors striving for an Olympic medal or Academy Award, things most of us often think of as great. 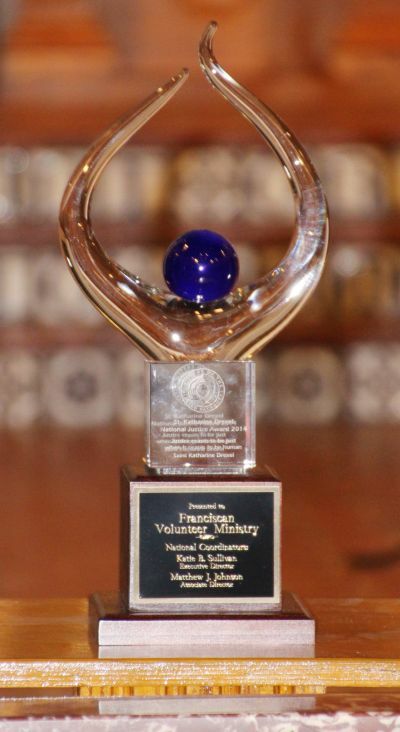 The National Justice Award is annually presented by the sisters of the Blessed Sacrament to a person or persons as part of the celebration of the feast day of their foundress, St. Katharine Drexel. Accepting the award on behalf of Franciscan Volunteer Ministry were national coordinator Katie Sullivan and assistant national coordinator Matthew Johnson, both of whom are former Franciscan Volunteers themselves. Volunteers are generally between the ages of 19 and 26, and most are immediately post-college, but not necessarily so, explained Sullivan, who is a graduate of Holy Cross University. She is herself a former Franciscan Volunteer, missioned to St. Francis Inn in 1995. The work of volunteers is especially important for St. Francis Inn, which neither receives nor seeks city, state or federal government funding. It is a pure Franciscan charity that can only exist through the use of volunteers and the support it receives by donations from many parishes and churches. 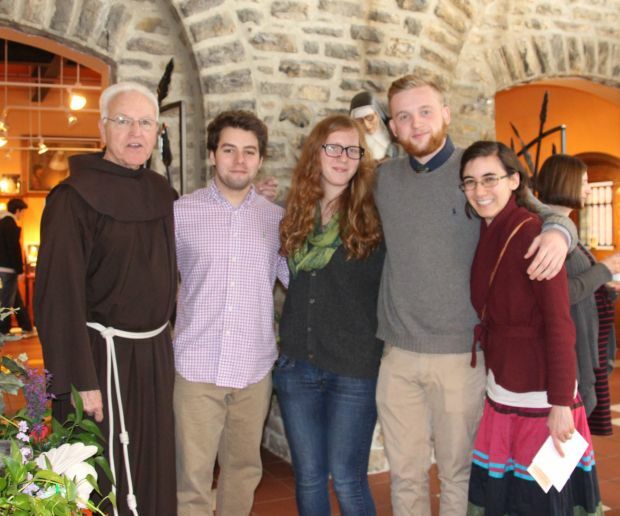 Tammy Kinney, a current volunteer who was cantor at the Mass, is from Utica, N.Y. She first encountered the Franciscan Volunteers during a Christmas break week of service at St. Francis Inn during her freshman year of college. “I encountered the poor and the marginalized I always dreamed of serving as a child,” she said. All the volunteers are single, if for no other reason there are no facilities for married couples, but that doesn’t mean some of them do not date. For example, Christopher Huot, who was a Franciscan Volunteer at the Inn from 1999 to 2001, met his future wife, Heather Burns, during her year of service, 2000-2001. Married now, they have two children with a third expected shortly. The family attended the St. Katharine Drexel Mass and the award ceremony. For Heather, who is the daughter of Permanent Deacon Robert Burns of Philadelphia’s St. Matthew Parish, assistance to St. Francis Inn continues. Her son Matthew is in third grade at Nazareth Academy Grade School, where “they do a lot for St. Francis Inn and we participate in that,” she said. Not all parents are thrilled when their sons and daughters take time off to serve as a volunteer after completing their education instead of immediately seeking a well-paying job, Father Duffy conceded in his homily. Through volunteering at St. Francis Inn himself, Gerry Huot eventually joined the staff of diocesan-conducted St. John’s Hospice in Philadelphia, from which he just retired.